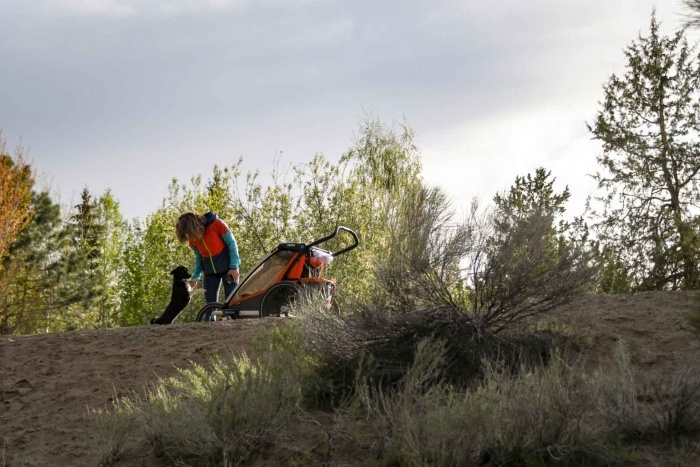 Built with compatibility for multiple outdoor sports, Thule evolves its Chariot line for 2017. Upgrades include new components and a more compactable design. As new parents (and longtime multi-sport athletes) we were on the hunt for the perfect stroller. It needed to transition from bike to run, then run to ski as the seasons changed. It had to fit into the car for easy transport. The updated Thule Chariot Cross does all this. With a modular design and various attachments, you can pull, push, roll, and glide over snow with baby in tow. Our son, Max, is now three-and-a-half months old. We’ve put hundreds of miles collectively on the Thule already, through sun, rain, wind, snow, and mud. Thanks to a rain cover and sunshade, we control and optimize the climate in his cockpit. It’s like Max is in his own little greenhouse: temp-regulated and always with a good view. After some serious daily use for this review—and to get back into pre-pregnancy fitness!—I am very happy with the Chariot. It won my husband and I over as an ultimate baby transporter and take-the-kid workout tool. Granted, you pay a premium for this product. It starts at $900, and for that you get the stroller and bike-tow kit. The running kit is an extra $120; the winter kit, which adds skis under the chassis, is an extra $300. All said and done, our ultimate baby workout machine costs about $1,300. I know, this is not an easy purchase. However, as an athlete who loves taking her son on adventures, I look at it as an investment. We will use it for years to come. 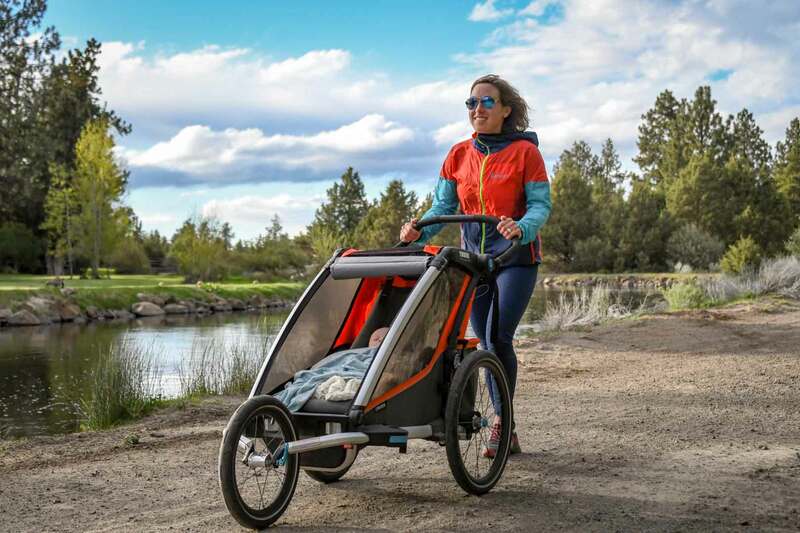 We use the Chariot Cross Stroller when we bike from our home in Bend, Ore., to a nearby river trail. There, we lock up our bikes and run a trail, converting it from a tow-behind to a jogging stroller in less than two minutes. The storage and extra cargo space is a plus. We use this space for errands at the grocery store or for full-day family bike trips where lots of gear is required. Compared to past models of the Chariot, the updated version compacts down 10 inches shorter than before. This makes it easier to transport and fit into cars. Thule added a plastic step to help toddlers get in and out of the stroller on their own. The shoulder straps are now removable and washable. In addition, all of the materials used on the stroller are now Bluesign approved. This assures an environmental-conscious family the product is non-toxic and not harmful to their baby. It’s worth noting that the Chariot Cross has a large cargo bag accessible to the cart “driver.” It’s a nice accessory, and we’ve loaded it with groceries and more. However, the company lists the max weight capacity at eight pounds. This seems low for the size and overall quality of the Chariot. We’ve gone past that weight without trouble, but it’s not recommended according to the user’s manual. The cargo bag also folds up when empty, allowing for more legroom when walking or jogging. When the Chariot is in running mode, three fixed inflatable wheels track straight. 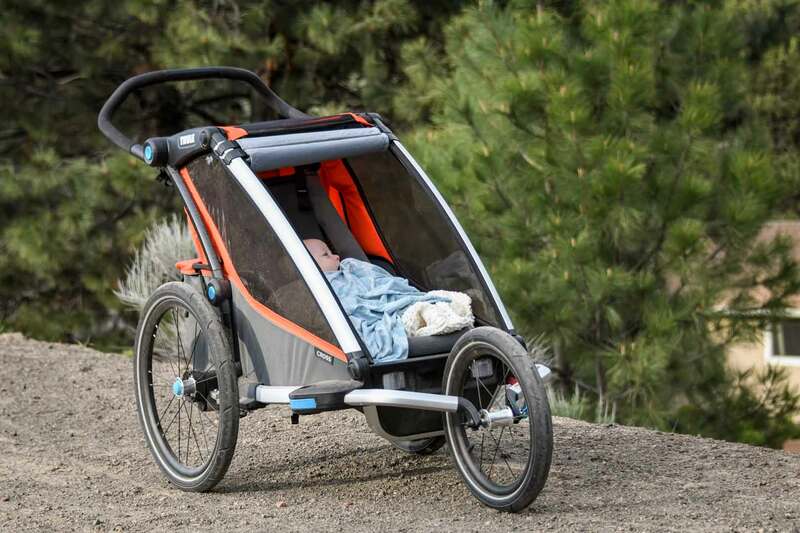 It’s comfortable for the “driver” pushing, and the baby inside glides mostly bump-free. The adjustable suspension helps even more. I can dial how stiff the stroller rides, so Max often falls asleep to the sway of the stroller as I run. The Chariot Cross’s wheels lock and handle grip adjusts for drivers of various heights. The screen, rain cover, and sunshade all roll up and tuck away in storage pockets along the stroller. 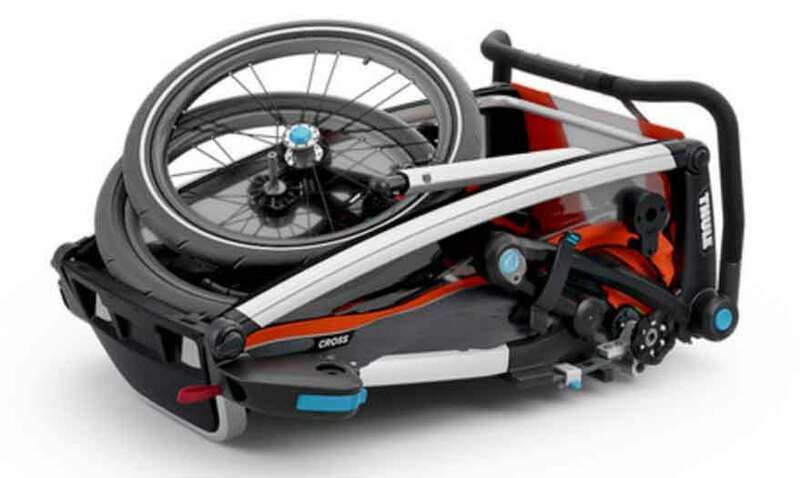 To go from walk-behind to tow-behind for biking, the front wheels pop out and sit in integrated holders. The tow bar nests alongside the child compartment. Remove it to slide it into place and attach it with a pin. Likewise for jogging, the front wheels stow and a large third wheel takes their place. When stowing the stroller for transport, the front and rear wheels have lever and push-button releases, respectively. Check out the video below for converting between Chariot Cross configurations. In bike-trailer mode the Thule weighs about 30 pounds. Add a 13-pound baby and some gear to the equation and it makes for a serious load. But you know how I try and view it? As a great workout! When pulling the trailer on a bike I’m burning more calories. Also, except for hills, the pulled weight is not a big deal. The system is so sleek that for flats and especially anything downhill sometimes I hardly notice it’s there. –See full details on the Thule Chariot Cross stroller.